This one-of-a-kind test facility mimics dynamic gas ﬂow conditions in deepwater oﬀshore oil production applications, providing critical performance data for gas-lift technology used for enhanced oil recovery. Southwest Research Institute provides a range of research, development and evaluation services to both government and industry clients. We offer extensive expertise and novel facilities supporting the needs of the defense and energy departments as well as the civil aerospace and oil and gas industries, among others. As a leader in providing solutions to minimize leaks from pressurized infrastructure such as pipelines, refineries and chemical processing plants, we successfully field-tested various new pipeline leak detection systems this year. For offshore oil spills, dispersal chemicals are typically used to break the spilled product into small droplets. We worked with the U.S. Department of the Interior to develop techniques that optimize dispersant selection and delivery. Hydrogen embrittlement can silently, without warning, compromise the offshore pipeline systems that transport about a third of the world’s oil supply. The presence of hydrogen sulfide in oil can result in hydrogen embrittlement, leading to environmentally assisted cracking that can reduce the operational life of pipelines by decades. We are leading an effort to relate hydrogen permeation and trapping with the degradation of a material’s resistance to cracking. 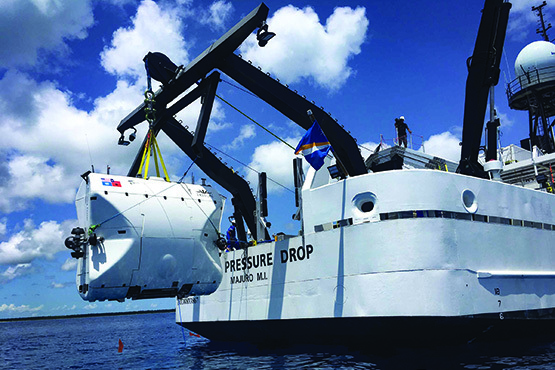 SwRI supported hydrostatic testing of a new deep ocean submarine. We instrumented the hull, developed an automatic data acquisition system and evaluated the vehicle’s pressure equipment. TOP: For hypersonic weapons research, SwRI launched a 5-centimeter blunt object at 16 times the speed of sound. 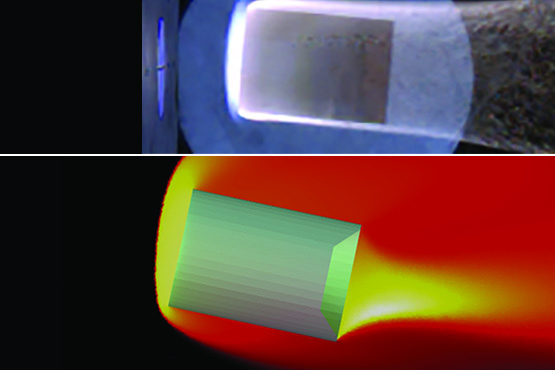 Note the resulting luminous gas in front of the flight body and the ablated material in its wake. BOTTOM: The corresponding computational image estimates the temperatures. SwRI is taking three decades of experience keeping aging military aircraft fleets operational and extending this structural integrity expertise to new applications. When infrastructure exceeds its original design life, we perform fitness-for-service (FFS) evaluations using a variety of tools and technologies. For example, we used NASGRO® fracture mechanics and fatigue crack growth analyses to complete FFS evaluations for a large U.S. government wind tunnel constructed more than 50 years ago. SwRI also uses classical fatigue analysis to support the mechanical and structural design of aerospace and related systems. In the defense arena, SwRI is investigating hypersonic weapons that could maneuver at speeds between Mach 5 and 20 at high altitudes, providing offensive targeting flexibility and challenges to missile defense. We used our new two-stage light gas gun to launch blunt bodies at Mach 16 at simulated high-altitude conditions and recorded flight characteristics of the body with high-speed digital cameras. Corresponding computations confirmed shock wave location and conditions, allowing engineers to estimate that the gas in front of the projectile exceeded 6,000 degrees Kelvin. These temperatures are hotter than the surface of the Sun, so thermal protection systems made of materials such as carbon-carbon composites and, potentially, ceramics are required for extended exposures. We have a long history of supporting U.S. launch vehicle development, providing propellant management and flight stability solutions. Over the past decade, we’ve expanded this research to include commercial launch providers, addressing instability associated with turbomachinery, combustion, pressurization and longitudinal aerodynamics. We are part of a team designing, building and testing fuel system accumulators for the Antares rocket, which has flown seven times as part of NASA’s Commercial Resupply Services program. Visit mechanicalengineering.swri.org for more information or contact Vice President Danny Deffenbaugh via email or call +1 210 522 2384.